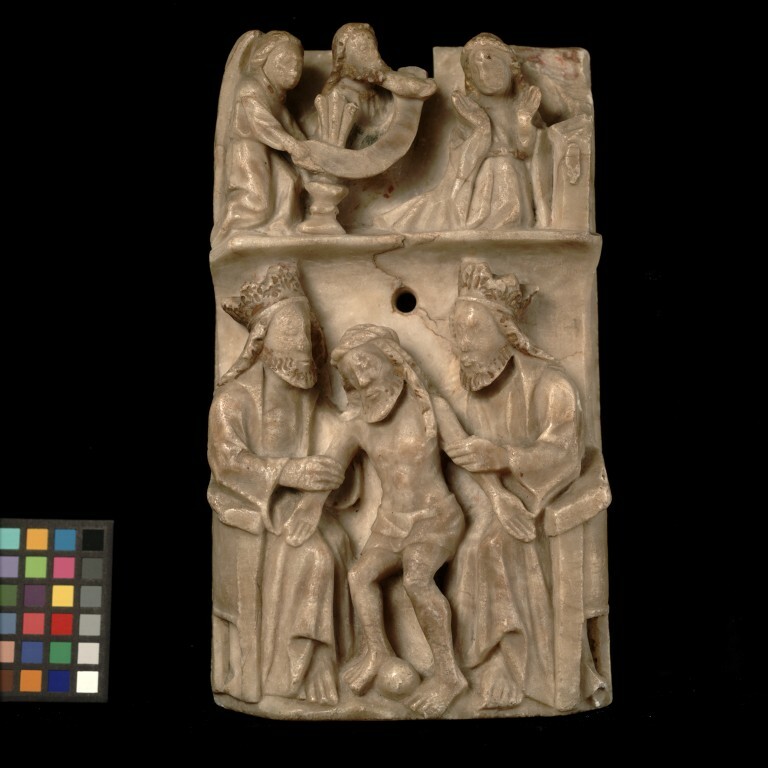 This small panel is carved with an Annunication scene is represented in the top third of the panel, and the bottom panel shows the risen Christ with an orb between his feet supported by God the Father and the Holy Spirit. The panel symbolizes the beginning and end of Christ's earthly life. This small panel is divided horizontally. An Annunciation scene is represented in the top third of the panel, with the Virgin Mary wearing a belted gown kneeling at a desk on the right. Her hands are raised in prayer and she turns toward the figure of the angel Gabriel kneeling on the left. A scroll, which presumably was inscribed with the words 'Ave Maria gratia plena,' curves up from his hands. A three-branched lily is in a pot in front of him. At the top of the panel the head and shoulders of God the Father are represented, a Dove issuing from his mouth apparently holding a wafer in its beak. In the lower part of the panel are the identical figures of God the Father and God the Holy Spirit, crowned, bearded and wearing gowns and cloaks, enthroned on the left and right. 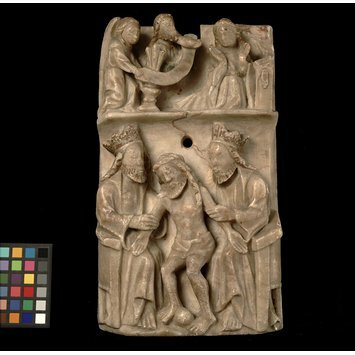 They support the apparently very weary figure of Christ, wearing the torse and a loincloth, an orb between his feet. The panel in its two divisions, appears to symbolize the beginning and end of the earthly life of Christ. There is a rectangle cut out of the top of the panel and a hole above Christ's head. The Virgin's desk is damaged. Traces of gilding remain on the crowns, hair and beards of the figures of the Trinity and on the hair of God the Father and the Virgin in the upper part of the panel. There is a slot in the back of the panel at the top, which may be relatively modern. There are three lead-plugged holes, two with latten wires attached. The bottom has been cut away. Acquired in Spain. Said to have been previously in Portugal. On loan from Dr W.L. Hildburgh since 1922. Given by Dr Hildburgh in 1946. Alabaster panel depicting the Trinity with Annunciation. English, late 15th century.